Billet aluminum power steering pulley for the 1" cog system p/n cogcss-1v. This part is for the keyed power steering pumps. this V-groove pulley will work on long water pump kits if you add p/n VG-1B or p/n VG-2A. This pulley is for a keyed power steering pump. Billet aluminum alternator fan that is made from 6061-T6 Aluminum and is hand polished. Billet Aluminum crank 2V-Groove pulley. This pulley bolts to the crank pulley on any long water pump cog system. Use this pulley when you are running power steering and air conditioning. The P/N PWS-2 will work with this pulley. Billet Aluminum crank V-Groove pulley off set. This V-Groove pulley bolts to the cog pulley on the crank. You can use this pulley on any of the long water pump cog pulley kits. 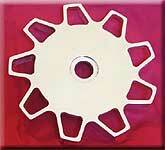 To drive power steering with your cog belt pulley kit you will need this pulley and the PWS-2. 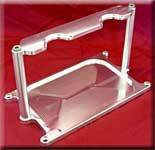 Billet aluminum Optima Battery Tray made from 6061-T6 aluminum. This part is made on a CNC machine to give it that machined look. This battery can be mounted in your trunk, and it comes with stainless mounting hardware. The battery tray will work with the red, blue or yellow Optima batteries.